Golfers have been turning to this region for year round golf in stunning settings, three challenging, world-class 18-holes golf courses are within a 15 minutes drive of Pissouri. 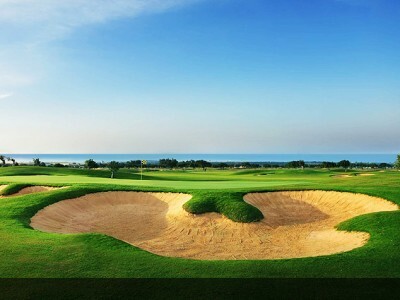 The immaculate course at Aphrodite Hills is considered to be one of the best in Cyprus and the middle East. Surrounded by a protected forest, the fairways cut through lakes, olive and carob trees. It overlooks the Mediterranean Sea from which a gentle breeze rises. The golf course comprises two plateaux separated by a dramatic ravine which offers golfers an original and breathtakingly stunning backdrop. The Secret Valley Golf Club is one of the most prestigious golf courses of the region, located nearby the famous area of Petra tou Romiou, the birthplace of Aphrodite. The course nestles in a scenic valley, surrounded by grand trees which add an aura of maturity to this fairly new golf course. The stunning rock formations offer panoramic views, giving golfers both the beauty of nature and the pleasure of golf. Championship trophies take place often accommodating those who enjoy the game. The Elea Golf Club offers world-class golf in a stunning setting, the course has been created to challenge golfers of every level. The par 71, 18-hole course, designed by Sir Nick Faldo, incorporates natural features to evoke a truly Mediterranean feel, created to be sympathetic to its stunning setting, while still embodying the traditions of the game as one of the top golf courses in Cyprus. Skill, strategy, precision – and maybe a little luck – set to be not only one of the best golf courses in Cyprus, but is already winning accolades as one of the leading golf destinations in Europe and beyond. Around 30 minutes away is also the Minthis Hills Golf Club in Tsada, Paphos, the course enjoys a historical location, situated in the grounds of a twelfth century monastery, from which the resort took its name. Its tranquil setting and mesmerising mountain views provide the perfect backdrop for a challenging game with its fairways swathing through mature trees and water features. At an altitude of 550m above sea level it’s a course for all seasons, enjoying cool breezes even during the summer. Originally designed by Donald Steel in 1994 it is the oldest golf course in Cyprus, and has recently undergone extensive enhancement by Mackenzie & Ebert.